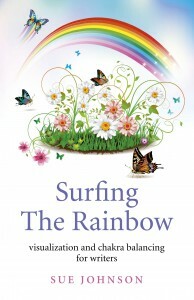 ‘Surfing the Rainbow’ combines my passion for writing and yoga. The breathing and visualization exercises will help writers in other aspects of their life – for instance when facing an appointment at the dentist or a job interview. It also helps with bringing creative ideas into focus and shows pathways towards achieving your creative ambitions. Every building on earth began as an idea in someone’s head before it became a reality. Visualization is an important part of writing. To the uninitiated, it can look like daydreaming and staring out of the window. However, this is often when the most important work is done. If you as the writer can see the events in your story clearly, then so will your reader. ‘Surfing the Rainbow’ also includes ideas on visualizing your ideal work space and creating ‘triggers’ in the brain that signify writing time. These can be playing a particular piece of music, lighting a scented candle or having a special crystal on your desk. You do need a little bit of time when you’re not likely to be disturbed – so it’s not a good idea to try it when the children are running riot or your husband or wife may need you for something. Take a few minutes to relax and slow your breathing down first. Don’t be in too much of a hurry to rush off when you’ve finished. Write down as much as you can remember when the idea is fresh. Make sure you eat and drink something – particularly if you’re going to be driving a car or operating machinery! The landscape of your novel isn’t just something you see – like a film – it needs to be experienced on all levels. Thinking about what a place smells and sounds like and including those details in your story will bring it alive for your readers. If at all possible, it’s a good idea to visit the locations you’re writing about. Take photos and sound recordings, collect anything that may be useful to you. Chakra is the Sanskrit word for wheel or circle. The earliest recorded mention of the word is in the Hindu holy books called The Vedas – some of which date back to 3000 BC. It relates to seven main energy centres in the body that are linked to particular organs or hormone regulators. Each chakra is associated with a colour of the rainbow, with red being at the base chakra and violet at the crown of the head. RED Take time to prepare well before you start. Clear any blockages that are likely to hold you back. ORANGE Create a rough outline of the story. Make sure there is enough conflict to sustain the interest and keep your reader turning the pages. GREEN Develop your settings. Interesting, well-drawn locations sell stories. INDIGO Use the senses! Colours, sounds, smells and textures help to create a full picture for your readers. VIOLET Finish what you have started. Then polish the story until it shines. For instance, in the YELLOW section which relates to creating characters, there is a questionnaire that helps to draw out fresh ideas about them. It then suggests that you follow those characters around the kitchen, bathroom and bedroom to see how they behave. You need to know the characters in your story better than you may know some members of your family. You will know when you’ve achieved this because they start talking back to you. With my first novel ‘Fable’s Fortune’ my main character insisted on a change of name. (At the time, the book was called ‘Cloak of Stars’. When I found the right name for my heroine, it led automatically to a new title. The book was accepted by a publisher soon afterwards. When working with the exercises in ‘Surfing the Rainbow’ it’s a good idea to allow an equal amount of time for each colour to begin with. If working on a novel, the best results come from beginning with red and working through the book. For instance, you could spend three days or a week on each colour to begin with. Allow your ideas to settle and ferment and then, if you need to, go back and revisit some of the colours. 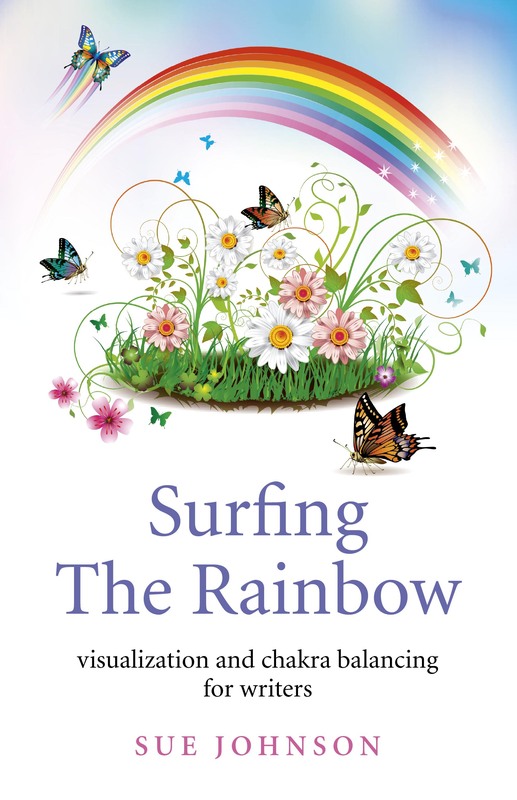 Many readers have reported that the quality of their lives have improved as a result of working through the exercises in ‘Surfing the Rainbow.’ One lady said she’d become more aware of colour, sound and scent and had become inspired to create a book of her own recipes. Other reviewers have said they felt more positive and energised as a result of focusing on colour. The key thing to remember is to keep writing – however bad you feel your work is. You can’t edit a blank page! Aim for a short writing session every day. Fifteen minutes is good to begin with. Don’t try to write and edit at the same time. They involve different parts of the brain and you will soon feel frustrated and muddled and as if you’re not getting anywhere. Write first and edit later when the idea has had time to settle. If you do feel stuck, then put your pen down or switch off the computer and try something different. For instance, you could listen to the sort of music your main character likes and see if this gives you any fresh ideas. Go for a walk or plant some seeds. Experiment with a new recipe – and imagine your main character doing the same thing!